This document serves as an introduction to using Cilium to enforce Cassandra-aware security policies. It is a detailed walk-through of getting a single-node Cilium environment running on your machine. It is designed to take 15-30 minutes. NOTE: Cassandra-aware policy support is still in beta phase. It is not yet ready for production use. Additionally, the Cassandra-specific policy language is highly likely to change in a future Cilium version. Now that we have Cilium deployed and kube-dns operating correctly we can deploy our demo Cassandra application. Since our first HTTP-aware Cilium Star Wars demo showed how the Galactic Empire used HTTP-aware security policies to protect the Death Star from the Rebel Alliance, this Cassandra demo is Star Wars-themed as well. Apache Cassanadra is a popular NOSQL database focused on delivering high-performance transactions (especially on writes) without sacrificing on availability or scale. Cassandra operates as a cluster of servers, and Cassandra clients query these services via a the native Cassandra protocol . Cilium understands the Cassandra protocol, and thus is able to provide deep visibility and control over which clients are able to access particular tables inside a Cassandra cluster, and which actions (e.g., “select”, “insert”, “update”, “delete”) can be performed on tables. With Cassandra, each table belongs to a “keyspace”, allowing multiple groups to use a single cluster without conflicting. Cassandra queries specify the full table name qualified by the keyspace using the syntax “<keyspace>.<table>”. Employee Attendance Records : Use to store daily attendance data (attendance.daily_records). Deathstar Scrum Reports : Daily scrum reports from the teams working on the Deathstar (deathstar.scrum_reports). cass-server : A single pod running the Cassandra service, representing a Cassandra cluster (label app=cass-server). empire-hq : A pod representing the Empire’s Headquarters, which is the only pod that should be able to read all attendance data, or read/write the Deathstar scrum notes (label app=empire-hq). empire-outpost : A random outpost in the empire. It should be able to insert employee attendance records, but not read records for other empire facilities. It also should not have any access to the deathstar keyspace (label app=empire-outpost). All pods other than cass-server are Cassandra clients, which need access to the cass-server container on TCP port 9042 in order to send Cassandra protocol messages. The file cass-sw-app.yaml contains a Kubernetes Deployment for each of the pods described above, as well as a Kubernetes Service cassandra-svc for the Cassandra cluster. Kubernetes will deploy the pods and service in the background. Running kubectl get svc,pods will inform you about the progress of the operation. Each pod will go through several states until it reaches Running at which point the setup is ready. Connected to Test Cluster at cassandra-svc:9042. We have confirmed that outposts are able to report daily attendance records as intended. We’re off to a good start! But what if a rebel spy gains access to any of the remote outposts that act as a Cassandra client? Since every client has access to the Cassandra API on port 9042, it can do some bad stuff. For starters, the outpost container can not only add entries to the attendance.daily_reports table, but it could read all entries as well. Uh oh! The rebels now has strategic information about empire troop strengths at each location in the galaxy. We see that any outpost can actually access the deathstar scrum notes, which mentions a pretty serious issue with the exhaust port. Obviously, it would be much more secure to limit each pod’s access to the Cassandra server to be least privilege (i.e., only what is needed for the app to operate correctly and nothing more). We can do that with the following Cilium security policy. As with Cilium HTTP policies, we can write policies that identify pods by labels, and then limit the traffic in/out of this pod. In this case, we’ll create a policy that identifies the tables that each client should be able to access, the actions that are allowed on those tables, and deny the rest. 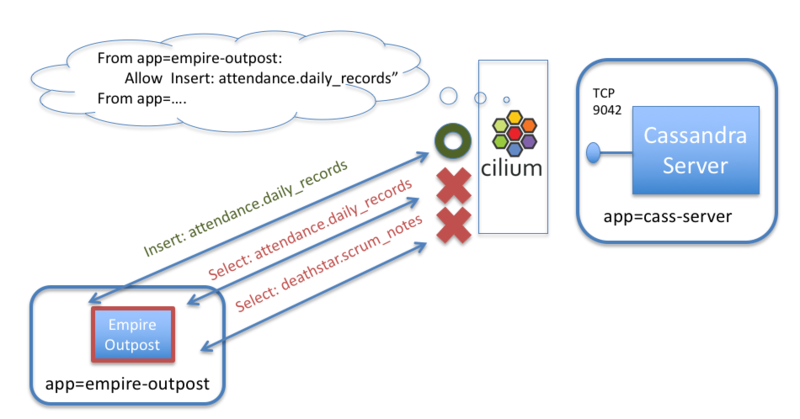 As an example, a policy could limit containers with label app=empire-outpost to only be able to insert entries into the table “attendance.daily_reports”, but would block any attempt by a compromised outpost to read all attendance information or access other keyspaces. A CiliumNetworkPolicy contains a list of rules that define allowed requests, meaning that requests that do not match any rules are denied as invalid. The rule explicitly matches Cassandra connections destined to TCP 9042 on cass-server pods, and allows query actions like select/insert/update/delete only on a specified set of tables. The above rule applies to inbound (i.e., “ingress”) connections to cass-server pods (as indicated by “app:cass-server” in the “endpointSelector” section). The rule applies different rules based on whether the client pod has labels “app: empire-outpost” or “app: empire-hq” as indicated by the “fromEndpoints” section. The policy limits the empire-outpost pod to performing “select” queries on the “system” and “system_schema” keyspaces (required by cqlsh on startup) and “insert” queries to the “attendance.daily_records” table. The full policy adds another rule that allows all queries from the empire-hq pod. Unauthorized: Error from server: code=2100 [Unauthorized] message="Request Unauthorized"
This is because the policy only permits pods with labels app: empire-outpost to insert into attendance.daily_records, it does not permit select on that table, or any action on other tables (with the exception of the system. * and system_schema. * keyspaces). Its worth noting that we don’t simply drop the message (which could easily be confused with a network error), but rather we respond with the Cassandra Unauthorized error message. (similar to how HTTP would return an error code of 403 unauthorized). This is blocked as well, thanks to the Cilium network policy. As a bonus, you can re-run the above queries with policy enforced and view how Cilium provides Cassandra-aware visibility, including whether requests are forwarded or denied. First, use “kubectl exec” to access the cilium pod. The Kubernetes label-based identity of both the sending and receiving pod. The ‘verdict’ indicating whether the request was allowed by policy (‘Forwarded’ or ‘Denied’). After this, you can re-run the tutorial from Step 1.